Abhi and Pragya come face-to-face while on their way to get Prachi out of jail. In the previous episode of Kumkum Bhagya, Prachi gets arrested by the police for stealing the necklace. Abhi tries to protect her but his family stops him. Shahana tells Pragya about everything, including Prachi’s arrest. Pragya decides to come to Delhi and save Prachi. Mira, Rhea’s caretaker, hears about the plan to frame Prachi and slaps Rhea in anger. In tonight’s episode, Aliya scolds Mira for slapping Rhea. She tells her that as a caretaker she had no right to slap Rhea. To Mira’s surprise, Rhea takes her side and says that she considers Mira to be her mother and so she had the right to slap her when she’s wrong. Mira tells Rhea that what she did to Prachi was very wrong and she should try and be a better person. 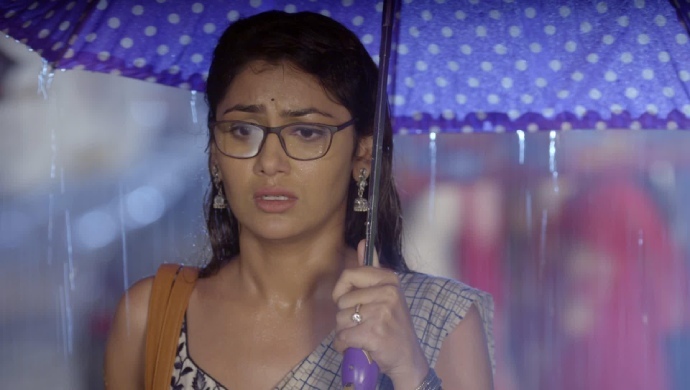 After informing Pragya, Shahana goes to the police station where Prachi is in jail. She tries to get Prachi out but instead makes matters worse. The policeman begins suspecting that Shahana too was involved in the robbery. To stop Shahana from going to prison, Prachi admits that the necklace was in her pocket and she stole it. The policeman then asks her to sign the confession letter and admit her crime. Aliya is hurt when Rhea chooses to take Mira’s side. Rhea calms her down saying that she took Mira’s side so that Mira won’t complain to Abhi. That way, their plan would not be affected and Mira would believe that Rhea learnt her lesson. Abhi knows in his heart that Prachi could not rob the necklace. When he is alone in his room, he decides to go and get Prachi out of jail. Pragya, who has reached Delhi by train, is also headed straight to the police station. Waiting for a cab in the rain, Pragya’s umbrella flies away and lands on Abhi’s windshield. Due to the heavy rain Abhi and Pragya can’t see each other’s face. However, he hears Pragya’s voice and gets out of his car to call out to her. By then, Pragya already finds a cab and leaves. Meanwhile, Prachi ends up signing the confession letter to make sure that Shahana stays out of jail. Will it become too late for Abhi to save Prachi from jail and will he meet Pragya there? Stay tuned to find out.